Yesterday was a chilly Sunday. Like -28° windchill. So after a brief run to the grocery store to stock up for the week, I spent the rest of the day hunkered down in our apartment. But it sure didn’t feel that cold. Sunlight streamed through our windows and heated up the place to a balmy 76°. I sat at the dining room table, soaking up the sunshine and trying out new stitches on my sewing machine. At the other end of the table, Gabe diligently studied his law books, stopping every so often to read me something he found absurd or funny or infuriating. The cat sprawled languidly at our feet, basking in the sunshine. 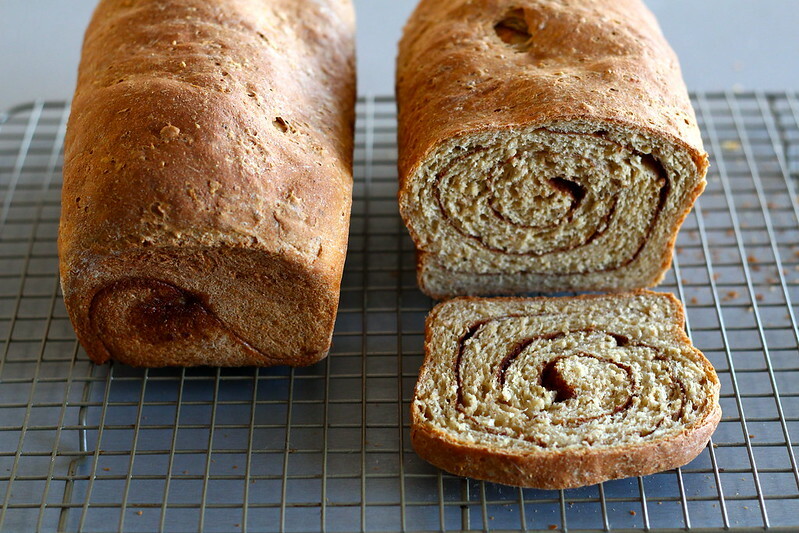 And in the oven, two loaves of cinnamon swirl bread rose over the tops of their pans and turned golden brown, sending a sweet aroma cascading through our tiny apartment. I paused for a moment to reflect on the scene in front of me. As much as I dream of the day Gabe and I buy a house together, I know I’ll look back on our 600 square feet of living space with poignant nostalgia. It may be small, but it sure is cozy. And the oven makes great bread. In the bowl of a stand mixer, whisk together milk, water, honey, and yeast. Whisk in egg and butter. Meanwhile, stir together flour, whole grains, and kosher salt in a large bowl. Stir the flour mixture into the milk mixture just until combined. The dough will be wet and lumpy. Let stand for five minutes. Fit the dough hook attachment to the stand mixer, and knead the dough on low speed for six minutes. Turn dough out onto a floured surface and knead a couple times by hand. The dough will be very sticky, but you can add a little more flour if it’s impossible to work with. Form the dough into a ball, cover with a bowl, and let stand for ten minutes. Knead a couple times by hand, and let stand for ten minutes, covered with the bowl. Repeat one more time. Place the dough in an oiled bowl, cover with plastic wrap, and let rise at room temperature until doubled, about 60-70 minutes. Meanwhile, in a small bowl, stir together brown sugar and cinnamon until well combined. Make an egg wash by whisking together egg and water. Lightly butter two loaf pans. Set aside. When the dough has risen, place it back onto a floured surface and divide into two pieces. Working with one piece at a time, roll the dough into a rectangle about 8 x 16 inches. 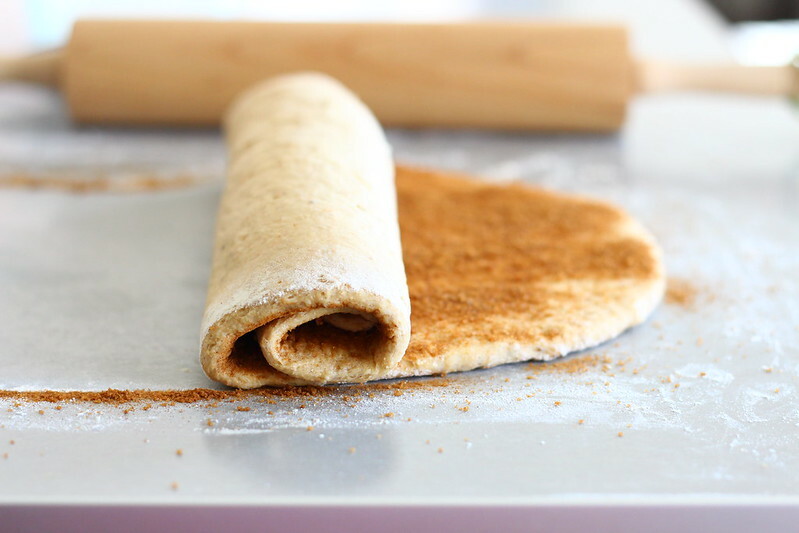 Brush the dough with the egg wash and sprinkle with half the cinnamon mixture. Working from a short end, roll the dough up into a loaf. Pinch the ends together to seal in the cinnamon sugar. Place the loaf into one of the buttered loaf pans. Repeat with the second half of the dough. Cover the two loaf pans lightly with plastic wrap and let rise until the dough has risen over the edge of the pans by about one inch, about 45-60 minutes. Halfway through the rise, preheat oven to 350°F. Bake the bread for 40 minutes, or until golden brown on top. The loaves should sound hollow when tapped, and the inside temperature should reach 190° F on an instant-read thermometer. Remove the loaves from the oven and let stand, in their pans, on a cooling rack for 10 minutes. Run a knife around the edge of the loaf pans to loosen the bread, and gently turn the loaves out onto the cooling rack. Let cool completely before slicing. * For the whole grains mixture, you can use any of the following: rye flour, rye meal, rye flakes, cornmeal, cooked grits or polenta, rolled oats or oat flour, amaranth, uncooked ground quinoa, cooked whole quinoa, quinoa flakes, or cooked brown rice. Measure by weight to get the best results. I used 70 grams of Bob’s Red Mill seven grain cereal and 90 grams rolled oats, both uncooked. Source: Slightly adapted from Peter Reinhart via Smitten Kitchen. Hi friends. Hello again. Sorry for the radio silence. I can blame my lengthy absence from this blog on being very busy and important, but that’s a pretty lame excuse. We’re all busy. Truth is, with Gabe gone last summer, most of my meals consisted of summer vegetables, baguettes, and cheese, so there wasn’t much to post about. And then after we got married and he was home with me again, I was more interested in cooking and eating food than making my poor husband wait while I photographed our supper in just the perfect light. But guess what? I missed this space. I’ve still been cooking and recipe tweaking like crazy, but I really missed the creative challenge of food photography. So I’m back. Even though it’s February in Minnesota and the light is mostly gray and the produce is uninspiring. I’m back, and I’m hoping to be seen a little more frequently around here. Along those lines, here’s an unorthodox recipe for February: ice cream. 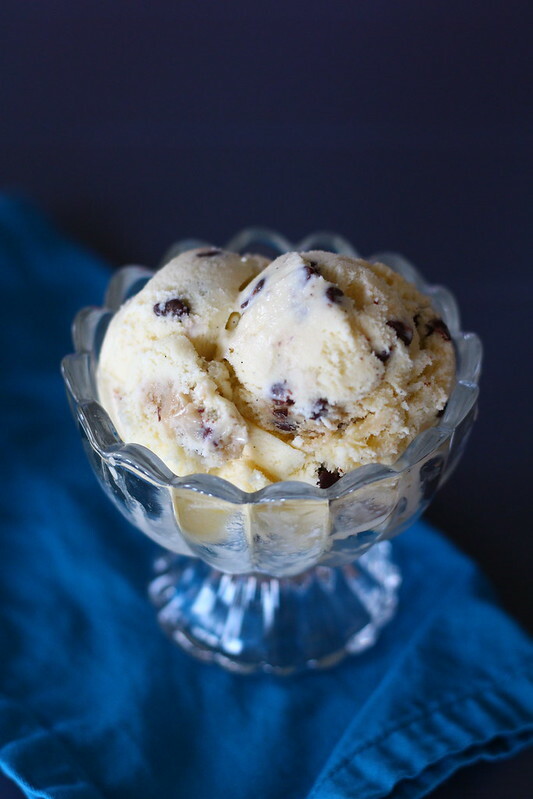 Cookie dough ice cream, to be exact. I have fourteen ice cream recipes on this blog, so adding one more seems like just the ticket for getting back in the blogging game. Consider it a thank-you from me to you. Thanks for still being here! Make ice cream: Whisk together milk, sugar, 1 cup of the cream, and salt in a medium saucepan. Warm over medium heat until steamy, stirring occasionally and being careful not to scorch the bottom. Remove from heat and scrape the seeds from the vanilla bean into the saucepan. Place the pod in the mixture as well, cover, and remove from heat. Let steep for 30 minutes. Immediately pour the egg yolk mixture through the mesh strainer and into the cream. Stir and chill in the refrigerator for at least 8 hours. Meanwhile, make the cookie dough: Cream together sugars and butter in a medium bowl. Stir in vanilla, milk, flour, and salt until well combined. Stir in mini chocolate chips. Scoop into balls and place on a cutting board or cookie sheet. Freeze for a couple hours, then chop into smaller pieces. Keep frozen until ready to use. Freeze ice cream in an ice cream maker according to the manufacturer’s instructions. Once the ice cream is done churning, stir in remaining 1/2 cup mini chocolate chips and cookie dough chunks. Store the ice cream in the freezer. Source: Ice Cream from The Perfect Scoop, cookie dough adapted from Allrecipes.com, following some of the modifications posted by someone named giggletush (seriously). * As always, I use equal amounts of lactose-free half-and-half in place of the milk and cream in this recipe.